Scott Mofhitz was born August 3, 1967 and passed away June 13, 2005. Scott was a loving son, grandson, brother, uncle, cousin, friend and sensei. Scott studied martial arts in Kosho-RYU Kempo and Gracie Jiu Jitsu. He then became a sensei and opened a martial arts school in Lohman’s Plaza. He had a very dedicated clientele, and then achieved the rank of second-degree black belt. 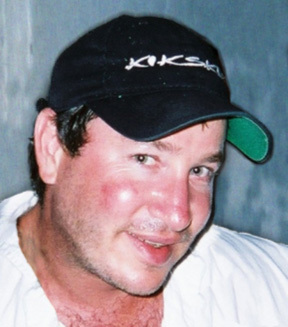 In 1994, Scott founded his company “Kikskin”. Kikskin is a martial arts apparel and fight gear company. Scott became a legend in the industry by designing the first Jiu Jitsu gi ever made solely for the American market. He was a student under Cesar and Ralf Gracie, when he realized the impact that Jiu Jitsu would have in the United States. With plenty of determination, he pioneered an industry that has grown astronomically in the past decade. Scott is missed by family, friends and athletes from around the world. We all loved his funny ways and warming smile, they are wonderful memories for us all. Scott is loved and missed very much. He is God’s Champion now. Please visit and sign our memorial guestbook for Scott.